We are happy to announce that the Mechanical Automated Membrane Aligner or MAMA tool has been commissioned with good results. This tool (which in actual fact is a dedicated Sunsensor assembly robot) has demonstrated the capability to assemble Sunsensors with a unprecedented precision. The operator loads a semi-assembled Sunsensor and a membrane. The operator connects the Semi-assembled sensor to the readout electronics. After closing the door, the tool picks up the membrane and suspends it above the semi-assembled sensor. The A high stability Sun simulator is turned on and illuminates the semi assembled sensor. The tool actively aligns the membrane with respect to the semi-assembled sensor and tag adheres the membrane into position. the assembled sensor can be removed for further processing without the risk of shifting the membrane to photodiode alignment. Although the principle of operation is simple, the actual implementation has not been without it’s issues. 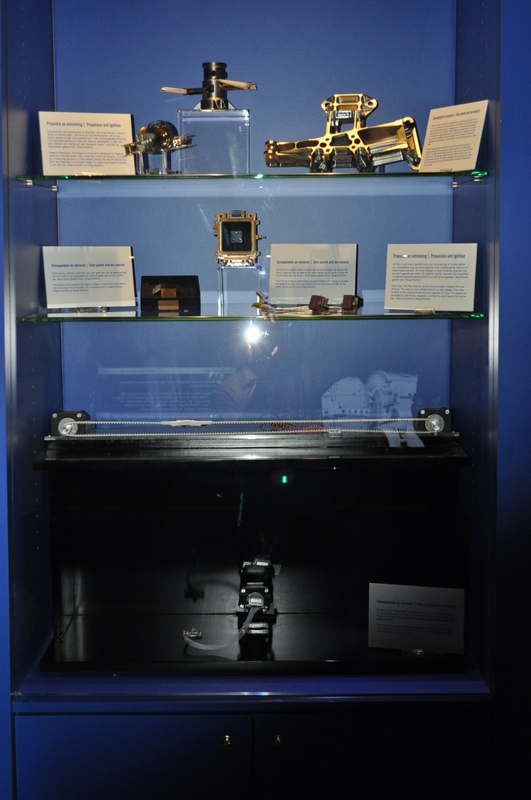 Perseverance and creativity were required to ensure the final assembly accuracy was in the micrometer range. 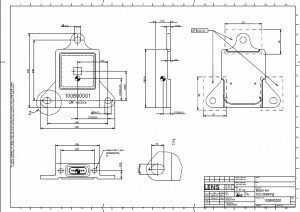 This type of accuracy also requires a careful mechanical design that ensures a very stable mechanical setup. 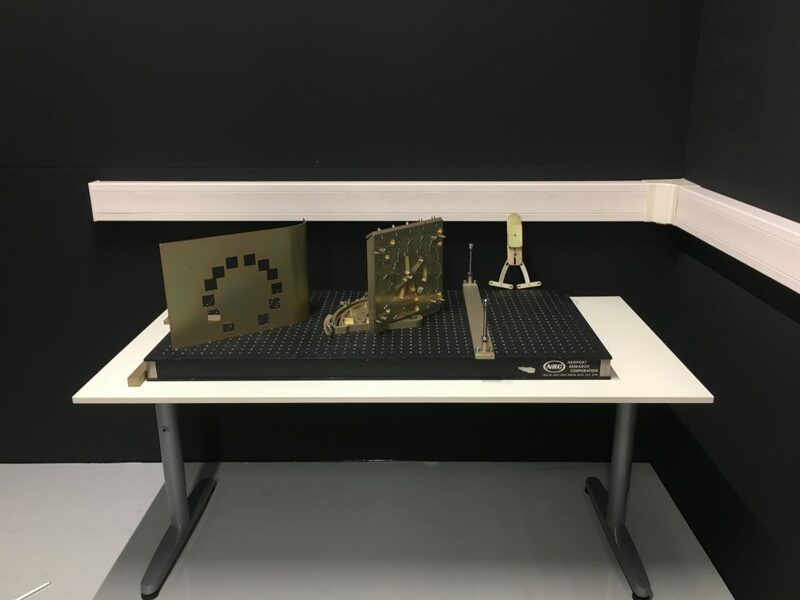 Although a special (dedicated) stable table is still under development, first assembly tests and associated calibrations have shown that the tool will allow us to reduce the non-calibrated accuracy of our sensors from 3.5° to 2° or even less. As we will only change the specification if we have proven the improved accuracy, we will have to calibrate a statistically significant number of sensors before we will formally reduce the specification. Nevertheless, based on tests performed so far we are fairly confident that the final specification will be somewhere between 2° and 1.5°. This means that the vast majority of missions will be able to fly our sensors without uploading any calibration data and without preforming any compensation calculations. As a result only a couple of simple formulas used on the currents measured will directly translate into the Sun attitude with respect to the mounting plane of the sensors. Because this significantly simplifies the use of the sensors, as no memory to upload calibration tables is needed, no code to perform the interpolation algorithms is needed and no configuration control to check if the correct correction tables are uploaded is needed. Consequently we are sure the MAMA tool directly contributes to our customers satisfaction. 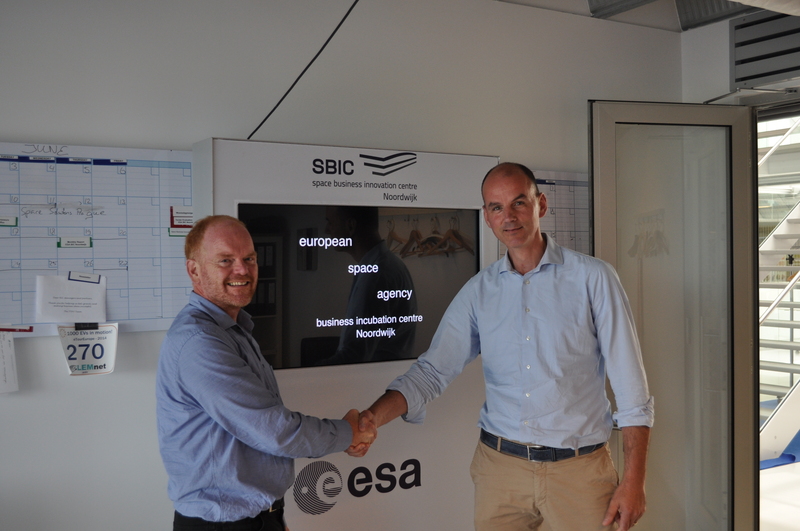 We would like to acknowledge the Netherlands Space Office (NSO) and the European Space Agency (ESA) for supporting this development in frame of the GSTP program. In addition (and on a personal note) I would like to thank our own Stefan Schmidt in particular for persevering and leading this sub-project into success. Although it wouldn’t have been possible without the mechanical engineering performed at Lencon Engineering and the software assistance of Frank Bulk and may other contributors, Stefan has been the driving force behind transforming the setup from only a tool into the MAMA tool. A tool with a beating hart, allowing Lens R&D to beat all known competition on non-calibrated accuracy and reproducibility. 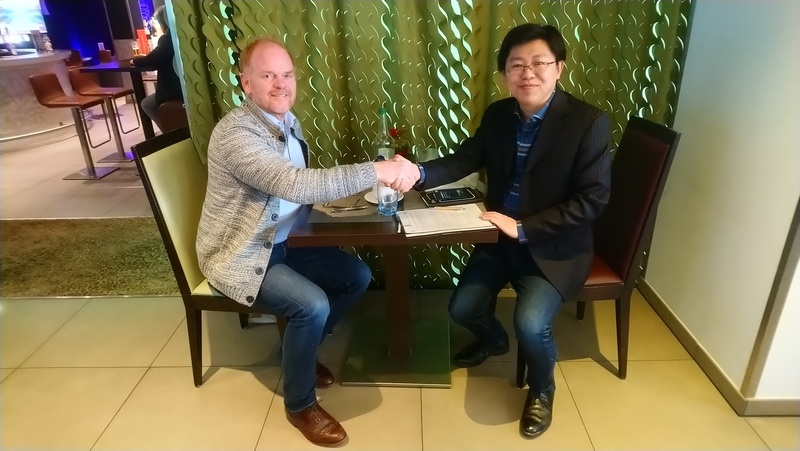 China sales representative agreement signed. Another step in the history of Lens R&D has been taken today when a sales representative agreement was signed between Microdrive Aerospace Ltd and Lens R&D. Leon Jiang (CEO of Microdrive Aerospace Ltd) and Johan Leijtens (CEO of Lens R&D) shaking hands after signing the agreement. Microdrive Aerospace Ltd will be the prime contact for our Chinese customers. This is seen as a very welcome step towards bridging time zones as well as avoiding potential issues with language barriers and cultural differences. The first steps towards gearing up activities in China will be translating of our datasheets into Chinese, and a visit to China in Wk12 (18th till 22nd of March). 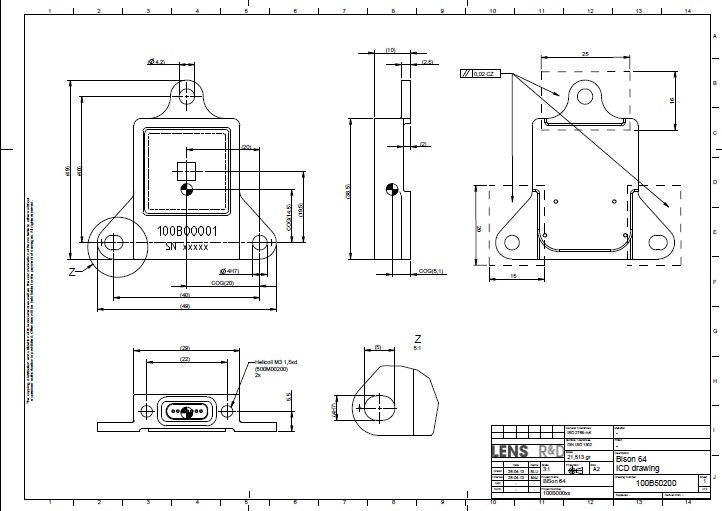 The Chinese datasheets will be made available on our website including a link to Microdrive Aerospace Ltd in case one would like to contact them for further information. On behalf of all employees of Lens R&D we would like to welcome the Microdrive team and express the hope that this will be a long, fruitful and prosperous cooperation. It took more than six and a half year before we could enjoy below lines. These simple lines are part of the launch manifest of a Falcon 9 to be launched on 19th of November 2018. The VESTA Satellite developed by SSTL for Honeywell and the ExactEarth constellation will be the first satellite to carry one of our BiSon64-B Sunsensors to space. Although we have delivered flight sensors to multiple missions no mission has flown yet. Consequently the VESTA satellite will mark the transformation from TRL8 to TRL9. One might wonder why it took so long to have a first flight qualification as nowadays people develop and fly space hardware in less then two years (some even in less than one year). The reason is simply because we are convinced that in the end the reliability of the devices flown is of prime importance to our customers and will prove to be a discriminator between Sunsensor manufacturers. Specifying something and keeping up appearances as long as nobody is individually checking the actual performance and rigidity of design is one thing. Specifying something and proving you meet ESA specifications even after rigorous environmental tests is something completely different. If in addition to this you want to focus on optimising for volume production and repeatability it is not possible to use just any manufacturer than can finish a job in a cost effective way. Instead a carefully selected supplier base is needed that can be relied on in the long run, The quality of all components will need to be checked and maintained, and it need to be ensured that proper procedures are defined and followed. Last but not least it requires to design, build and verify dedicated assembly and test equipment. 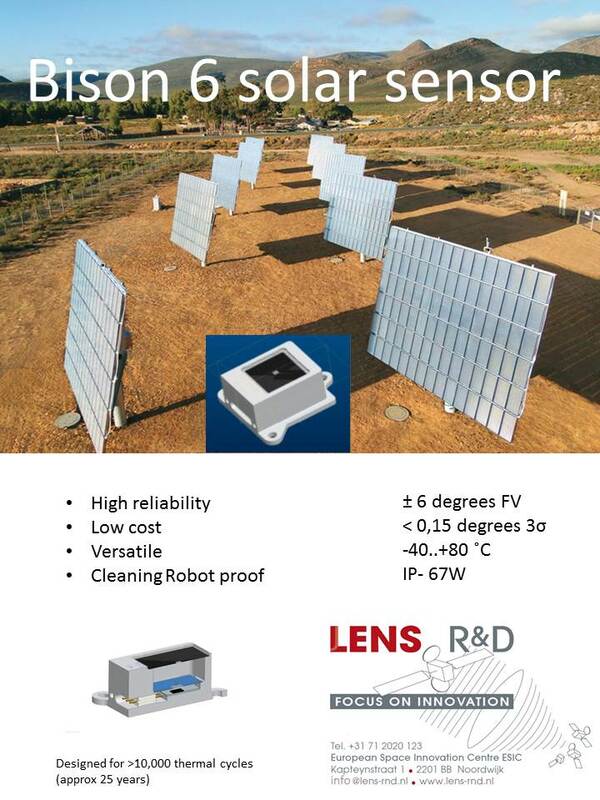 At Lens R&D we are proud to say that a team of capable people both at Lens R&D and our suppliers have redefined the world standard on Sunsensor environmental endurance and quality to cost ratio. 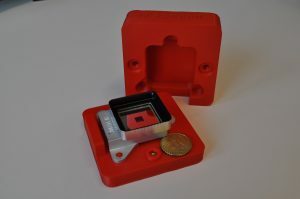 Once the first measurement data has been received, we will have all data available needed to show with a high degree of confidence that our sensors are capable of meeting (or exceeding) all requirements that can sensibly be posed to an analogue Sunsensor. 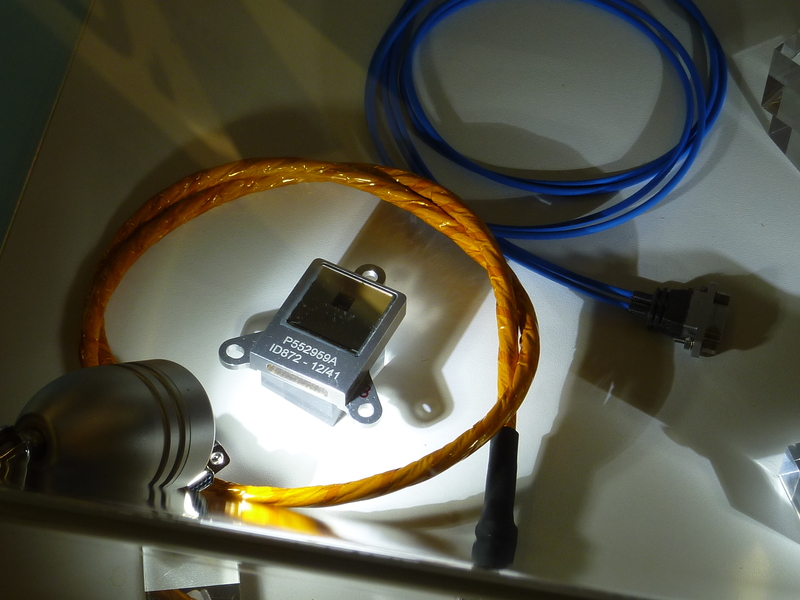 A couple of minutes ago DHL picked up the BiSon64-ET-B Sunsensors intended for the Luxspace SAT-AIS ESAIL mission. The delivery marks the end of en era for Lens R&D as it was actually the first flight project acquired back in 2015. Over this Artes21 program we managed to increase our experience as well as the qualification status of our products drastically and as such we are very grateful to Luxspace for selecting the BiSon64 Sunsensors well before the flight qualification was finished. We are looking back upon a very open and positive cooperation and hope to continue cooperating for many years to come. 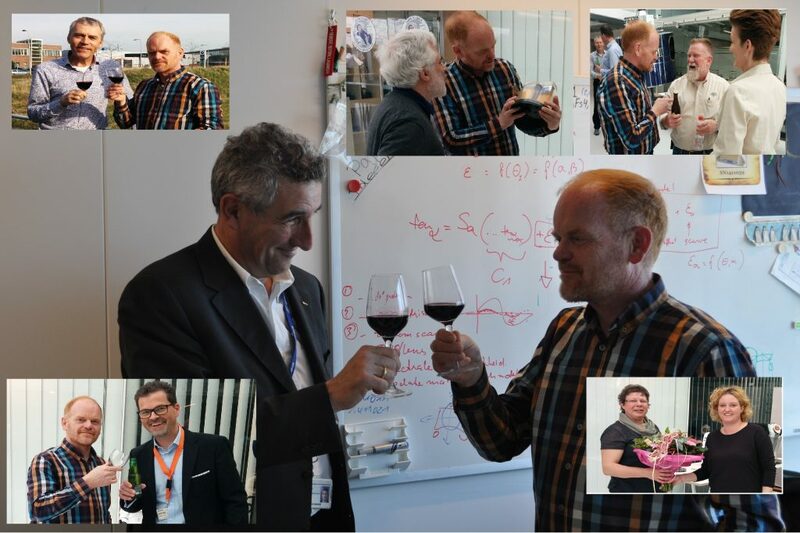 As all good things come to an end we would like to thank the Luxspace team, the team at ESA and our national space agency NSO for the support over the past number of years. We are eagerly awaiting the launch and first flight results and wish Luxspace lots of succes also with future projects. It is always nice to see our sensors projected on satellites that are actually being build. If you look carefully you can find five out of 6 BiSon64-B units that will be mounted on the Luxspace satellite called ESAIL. Although the above picture is only a CAD drawing, the actual satellite is nearing completion and launch is projected for Q2/2019. Our BiSon sunsensors actually achieved a significant level of qualification through the related ESA Artes21 program SAT-AIS and we are proud to finally see this platform accepted by ESA and ready for flight. Last Friday 26th of October, the team of students that designed and manufactured the spot-on tests setup have received two rewards (each worth 2500 Euro) during the annual NLF gala. 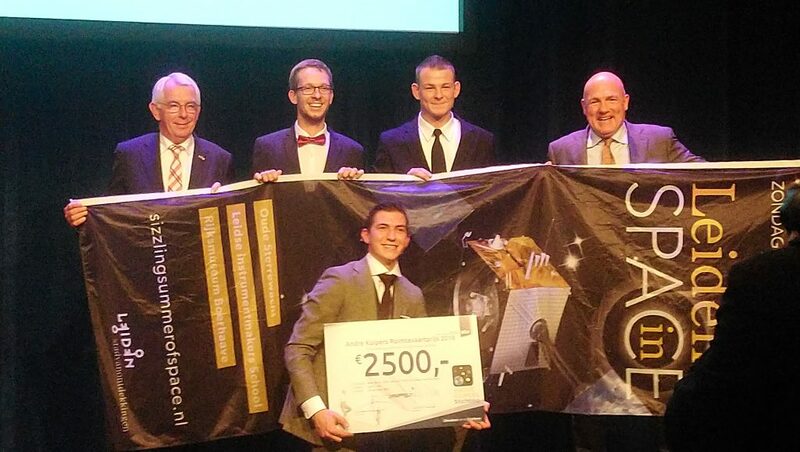 They received both the Jan Dullaert price for the best subject and the André Kuypers price for the best space related project. 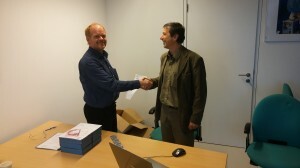 The latter was handed over by the Dutch astronaut André Kuypers himself. 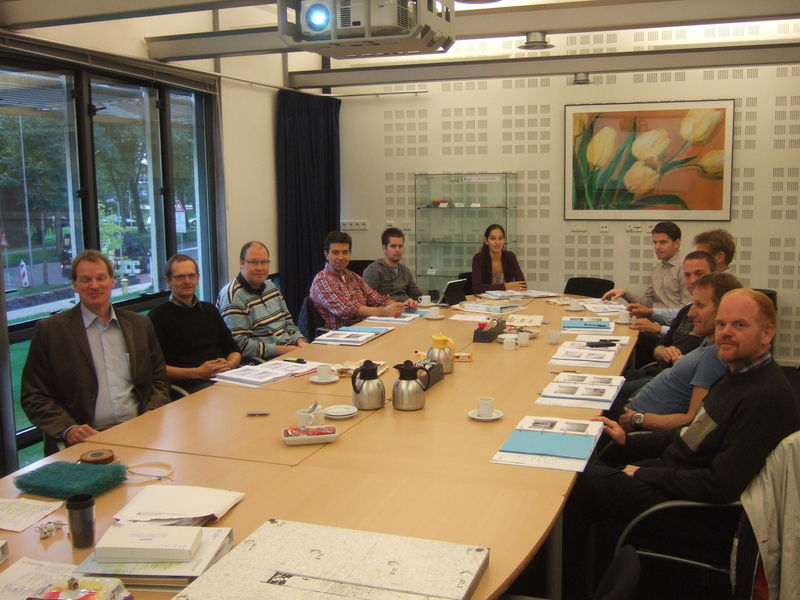 During a short discussion after the reward ceremony it became clear that the price was granted because of the excellent quality of work delivered and the craftmanship exhibited by the instrument builders trained at the Leidse instrumentmakers school (Instrument builders school of Leiden LIS). 4 years of intensive training and practical work have payed off for these young professionals in the sense that they have shown to be able to not only study and design, but also build a complicated precision setup intended to measure the temperature coefficient of BiSon64-ET sunsensors in vacuum over a temperature range of -125°C to +125°C. 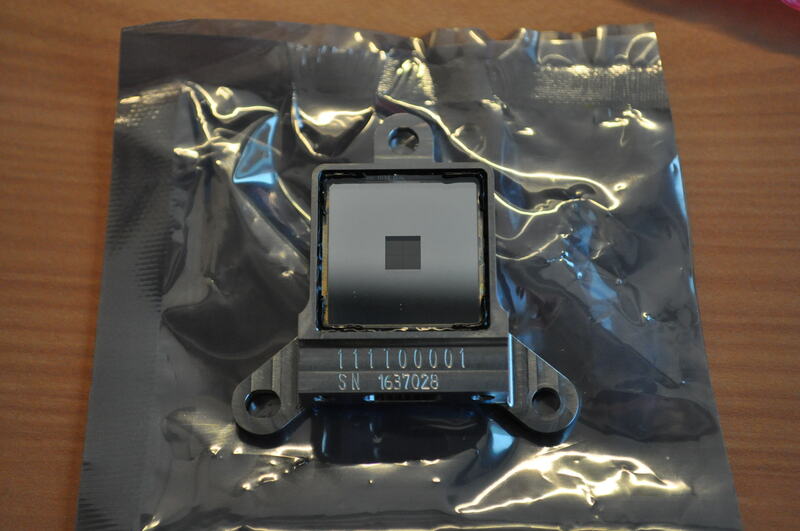 Due to this wide temperature range and the desire to test as many sensors as possible in a single go (to save time and money) a highly specialized setup was needed which is vacuum compatible, has a low thermal mass and a high thermal conductivity. very challenging requirements which have been met by means of a technically sophisticated solution. 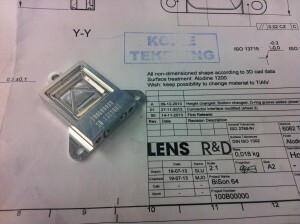 At Lens R&D we are proud of their success and happy with the project results. Our customers have come to expect reliable, cost effective and small solutions from Lens R&D, and the new developments of a sensor called IBIS is expected to bring exactly this. 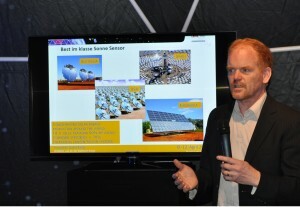 Based on a single chip dedicated sensor (IPS) to be developed by Systematic design b.v. (represented by Richard Visee and @Gert van der Horn on above picture) the IBIS is to be a true digital sunsensor which is not affected by earths albedo and has a digital interface to the on-board computer. 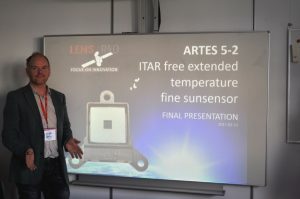 This is definitively to be seen as a new major step for Lens R&D on it’s way to be a recognized player in the field of high reliability sunsensors. 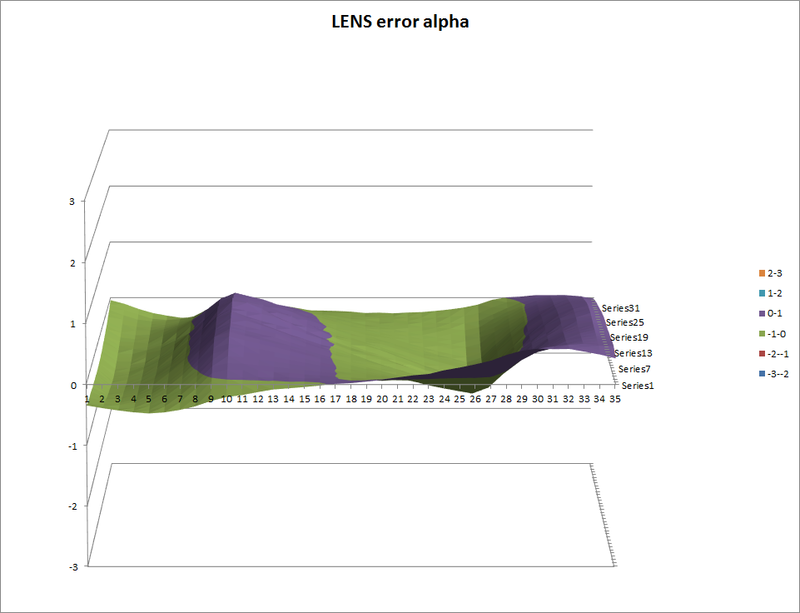 Currently this development is not including nice to haves like autonomous powering or wireless interfaces, but given the history of Lens R&D it should not come as a surprise that these issues will be born in mind while developing the imaging chip. Recently the mechanical parts for the spot-on test setup have arrived at Lens R&D. 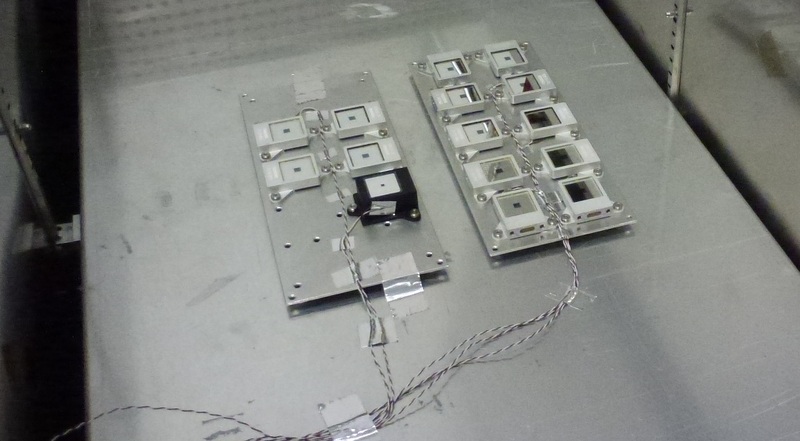 Under construction in frame of an ESA GSTP program to produce and quality extended temperature sunsensors, the setup is intended to allow temperature coefficient determination of 12 sunsensors simultaneously. 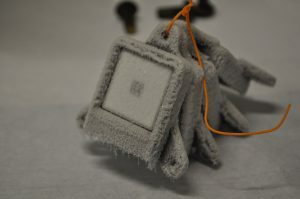 Because the temperature coefficient will have to be determined over a temperature range of -125°C to +125°C, this can only be done in vacuum while conductively cooling the sensors. A correct measurement however also entails using at least one reference sensor which is kept at room temperature throughout the process. 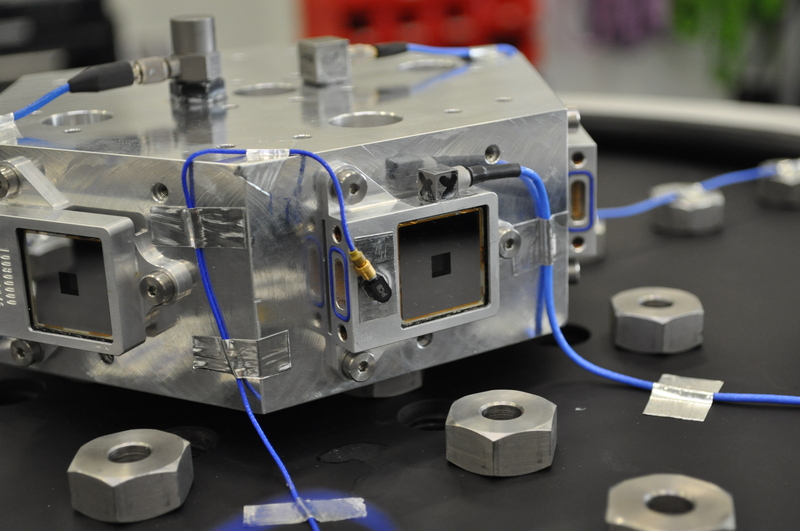 Last but not least, the tests will be performed at the MiVaF facility at ESTEC which uses an arc discharge lamp to generate the sun illumination signal and consequently produces a lot of 100Hz flicker. These requirements have led to the construction of a dedicated setup. 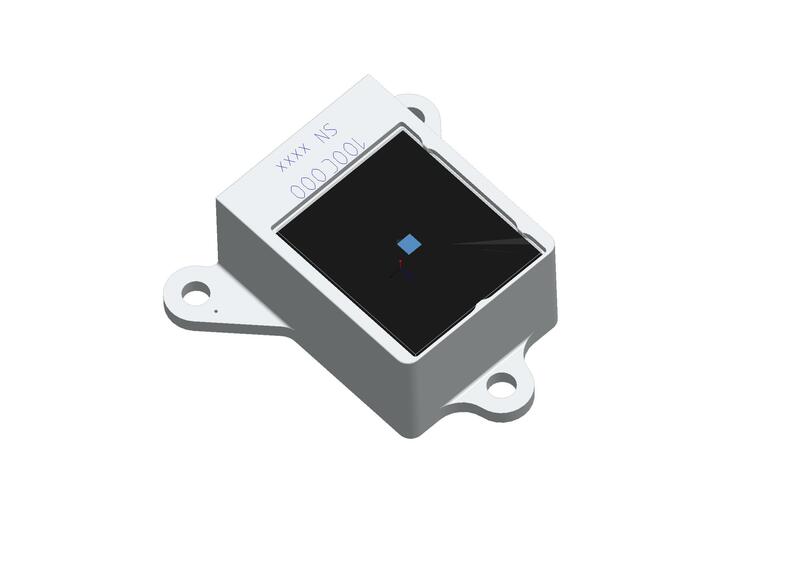 The effect of the flicker will be minimised by using dedicated simultaneous sampling electronics which will allow to readout all 56 photodiode and 14 thermistor signals within a fraction of a microsecond. 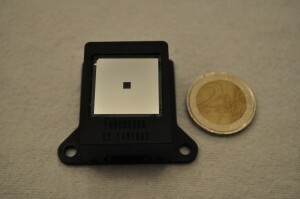 The unique setup will provide more insights into the quality of the ESA setup (temporal and spatial flicker noise) and will allow to optimise the calibration strategy to be followed if multiple sensors are to be calibrated for use as a coarse sunsensor. (taking all four generated currents together thus providing a single measurement value per sensor). Although never intended to be used as a coarse sunsensor, this mode of operation of the BiSon sunsensors is expected to give a higher accuracy than a single photodiode although with a slightly reduced field of view. 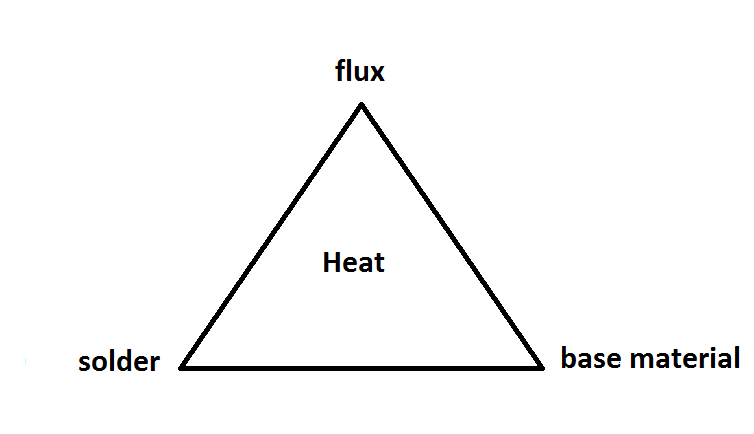 Measuring 12 sensors at the same time will allow for a cost effective determination of the temperature coefficient which is needed to operate the sensors outside of the fine sunsensor mode and the simultaneous sampling will avoid long measurement times needed to take several thousands of measurements to average out the source flicker. Another significant investment performed to get ahead of our competition in providing cost effective solutions for high reliability Sun sensing. 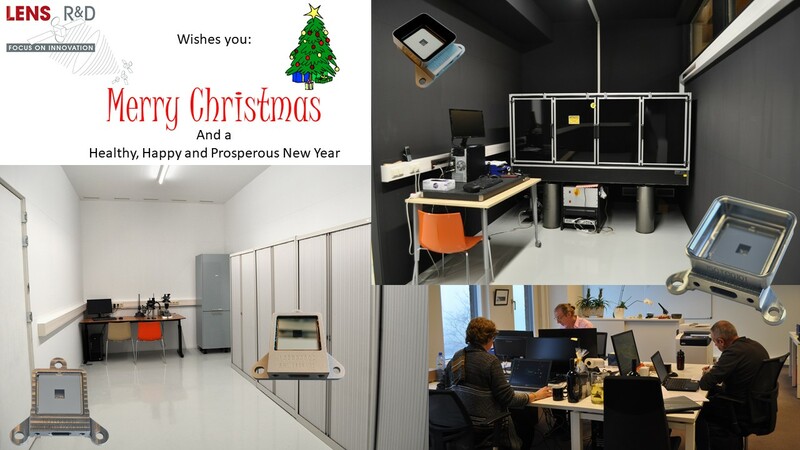 On the 19th of December during a small opening ceremony conducted by Kees de Boom (former TNO sunsensor business developer), Lens R&D inaugurated two dedicated cleanrooms at their new address ‘s-Gravendijckseweg 41b 2201CZ Noordwijk. The festivities were attended by several people partially traveling significant distances to share the joys associated with this new step in growing up as a company. 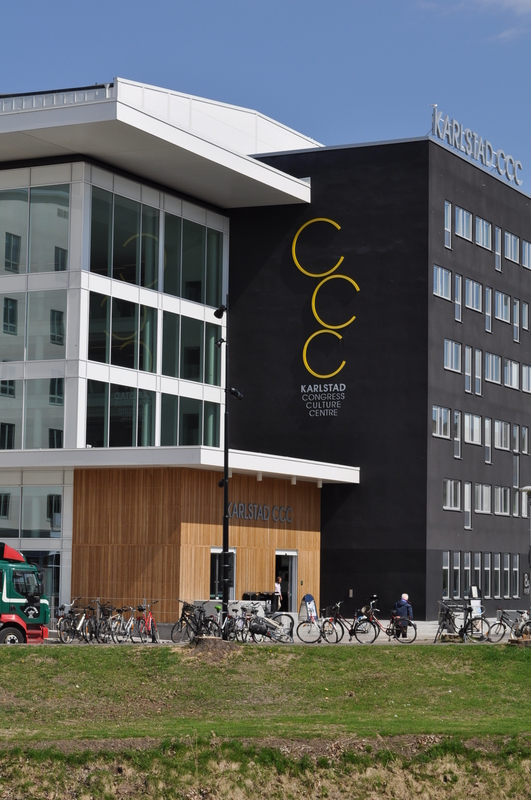 With these new facilities, Lens R&D is not only capable of sustaining further growth in turnover but also capable of fulfilling all requirements posed to a company delivering products that fulfil the highest quality standards. 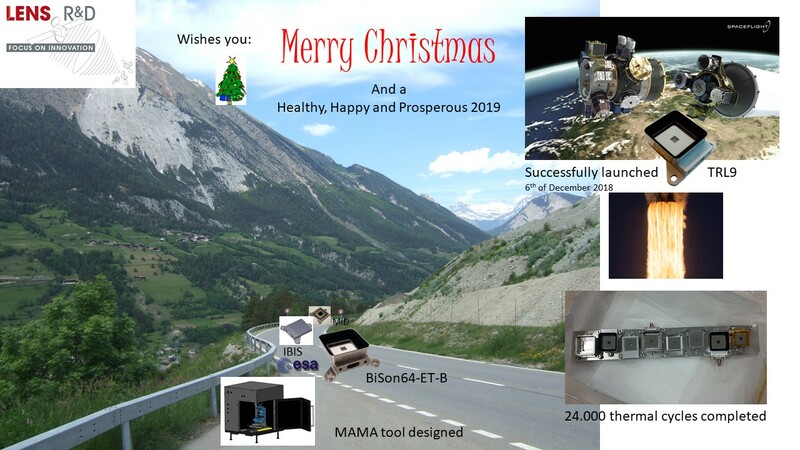 With an ESA GSTP program running that is intended to lead to a fully qualified BiSon64-ET and BiSon64-ET-B we cannot claim to have ESA qualified products yet, but we are convinced that 2018 will not only bring us the flight qualification of the regular BiSon64-B but also the ESA qualified status for the extended temperature version. Thank you for all the support, and looking forward to a sunny future. 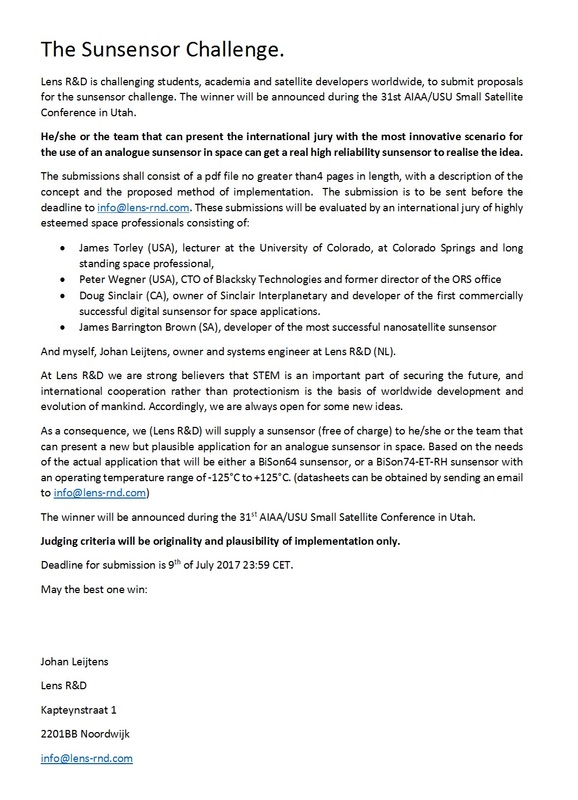 As it seems a lot of people have missed the invitation, another post of the sunsensor challenge at the AIAA/USU Small Satellite Conference in Utah. Looking forward to a lot of surprising submissions. although not very elaborate, the atmosphere was very good and even the weather cooperated in a fantastic manner as it was very sunny and some 8 degrees above the nominal average temperature in March. We especially welcomed the congratulations of Stanley Kennedy and Maureen O’Brian that attended all the way from Colorado USA and mr Franco Ongaro that even came outside the official celebrations because of obligations elsewhere during the party. 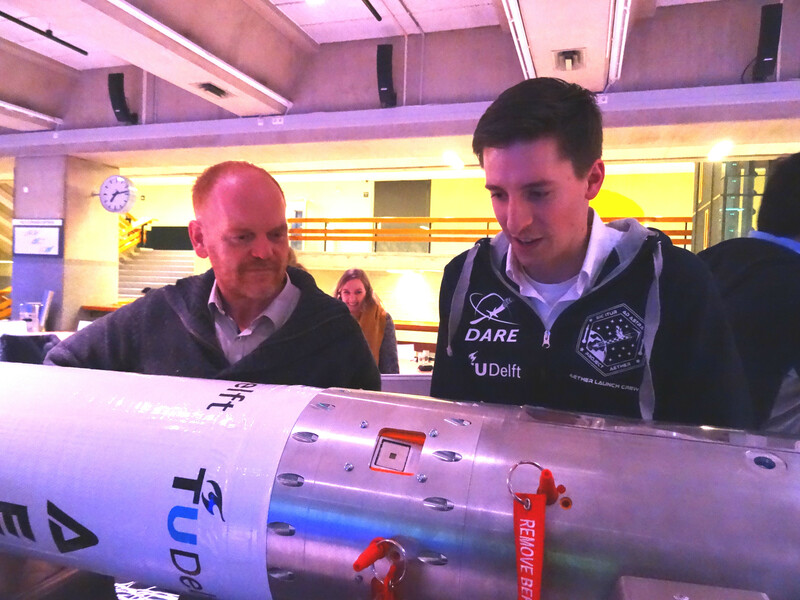 Today, the students from Delft Aerospace Rocket Engineering (DARE) showed the Aether rocket to the public for the first time. 3.3m in length and intended to reach Mach 1.7 before the parachute system is deployed at some 6km height, the rocket is not only a technology demonstrator for the stratos III rocket to be launched later this year (that will try to break the student rocket altitude record) but also contains three BiSon64 sunsensors that will be used to calibrate the on-board gyro’s in real-time and thus avoid rotation of the rocket which could hamper proper parachute deployment. 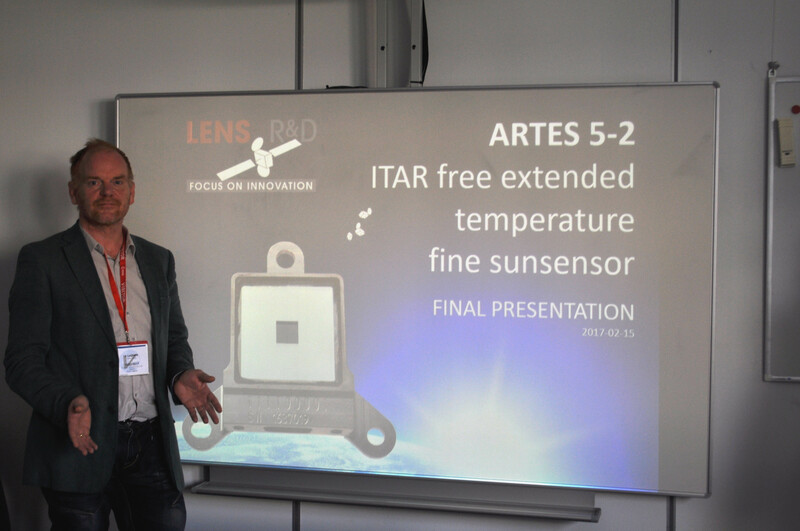 After 1.5 years of intensive development and testing we formally came to conclusion of the Artes 5.2 project ITAR free extended temperature sunsensor today by performing a final presentation. Based on inputs gathered from several potential suppliers over the years, the project started as a company internal project some 3 years ago. The main problem these sensors are intended to solve is that for satellites with extendable solar panels, the panels are often blocking part of the sunsensors field of view in the stowed configuration. Today (06/02/2017) we started advertising on the ISIS cubesatshop. The main products marketed on the cubesatshop are the BiSon64-B and the BiSon64. Next to this it is also possible to find data on the dedicated pigtails that can be obtained through Lens R&D as well as the special transport container the cap of which can also be used as a remove before flight item. It has taken quite some time before we decided to go and advertise as we wanted to make sure that we can deliver on the SCOTS promise. This promise is to deliver only top quality components for an off the shelf price and really off the shelf. Currently at TRL8 (a step which most cubesat hardware has skipped by going for a launch before full testing is completed) the first flight is planned for November 2017. An error that occurred during the vibration testing of our BiSon74-ET-RH sensors feels a bit like that. 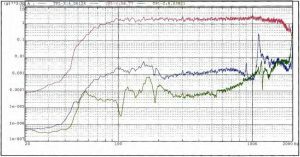 Although the sensors were programmed to be tested to very significant levels (1g^2/Hz totalling 38.9g) it has now been confirmed that there was an error in the piloting channel that led to much higher test levels (as can be seen in the accompanying graph. This plot (taken by the control accelerometer in Y axis) shows an integrated level of 58.77g and a spectral density which is more like 2g^2/Hz. Although we would never have asked for such high levels of testing ourselves, it feels like an advantage to have done so, knowing that the sensors have survived. Today we finished pyroshock testing at the ISISpace THOR facility. 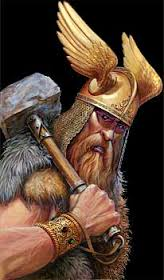 THOR stands for Testing Hammer for extraOrdinary Rough environments. 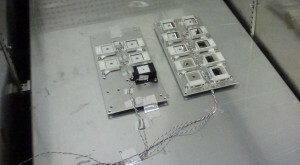 These tests were performed in frame of an ARTES 5.2 program called ITAR free extended temperature sunsensor. 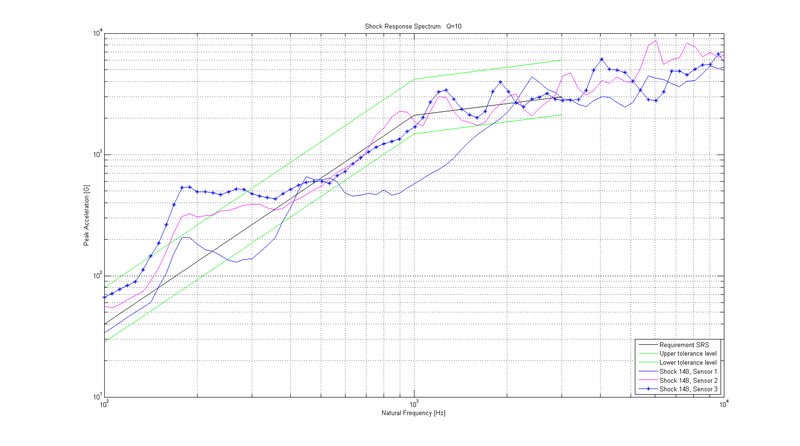 Today the test sequence was completed by administering 3 shocks of 3500g in all three directions. As electrical tests showed that non of the units lost functionality and there was some time left in the program, ISIS agreed in doing some additional tests. 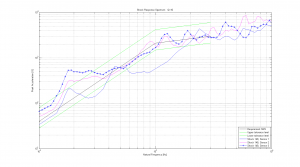 This lead to a second set of tests performed on three sunsensors (1 from each batch of BiSon74-ET-RH sensors and one BiSon64) in which another 3 shocks in all three directions was administered but this time at 10.000g. Designed in frame of the Artes 5.2 program ITAR free extended temperature fine sunsensor and intended to be the first small fine sunsensor to be capable of surviving the temperature excursions and radiation exposure experienced when mounted on extendable solar panels of geostationary telecom satellites, The BiSon74-ET-RH is intended to be a unique sensor, providing a cost effective and highly reliable solution to some issues already known for years. In stowed configuration, solar panels quite often obscure the field of view of sunsensors thus hampering effective attitude acquisition during the Launch and Early Orbit Phase (LEOP) of many missions. Mounting a sunsensor on the solar panel until now was not feasible because no generally available sunsensor could handle the temperature ranges associated with this application. In Safe mode operation, the reliability of the solution is of utmost importance, and adding a sunsensor to the solar panel is the most direct and reliable way to measure the orientation of the solar panel. This is why Lens R&D (with support of ESA) is developing and qualifying an extended temperature sunsensor who’s temperature range allows for application at even the most demanding positions on a satellite, be it thin mechanical brackets or solar panels. This is a sneak preview of the BiSon64-B and the associated transport package. The sensor consists of a standards BiSon64 to which a small baffle is added to reduce the influence of albedo signals originating from outside the measurement field of view. Adding less than 5 grams to the sensors the baffle allows to increase the accuracy of the sensors significantly if albedo signals or reflections from structural parts are present. 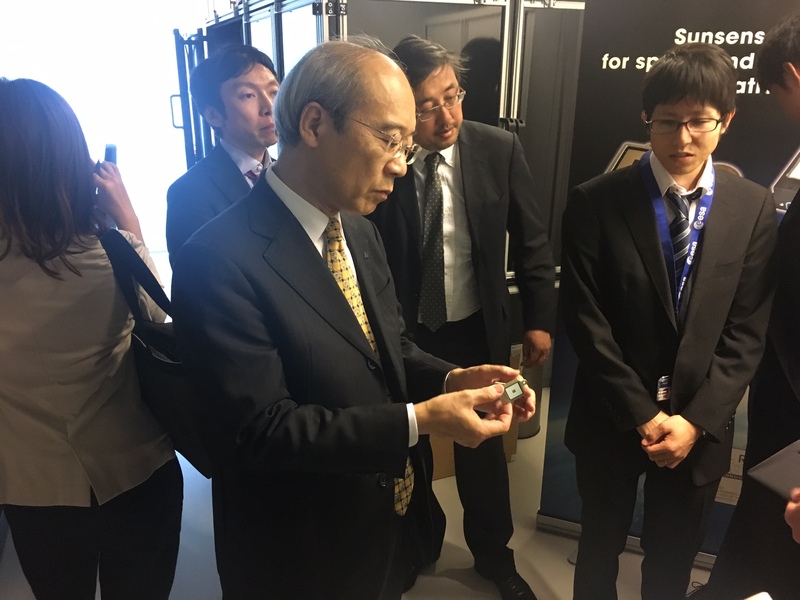 On 19th of October 2016 mr Yamaura and several other representatives of JAXA visited the facilities of Lens R&D in Noordwijk. After a short introduction on Lens R&D provided by Stefan Schmidt they got to see our super continuum based sunsensor calibration setup as well as various types of sunsensors both qualified and under design. 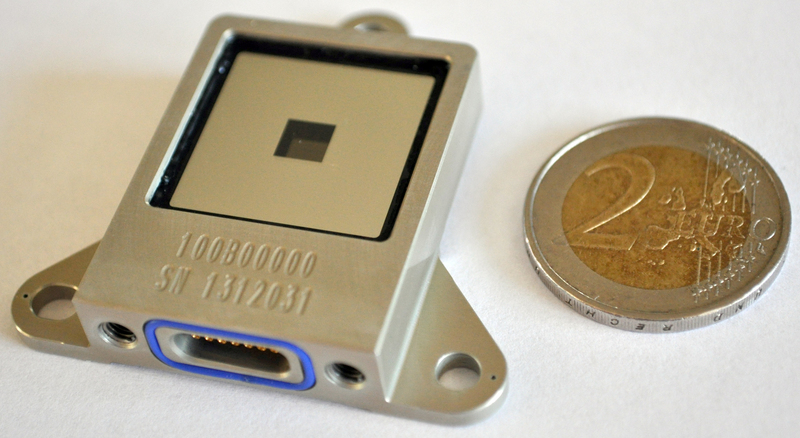 On 30th of September, Lens R&D supplied their first 12 flight standard BiSon64 sunsensors to SSTL. 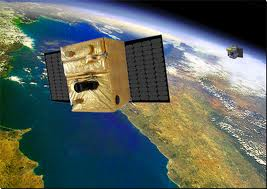 Surrey Satellite Technology Ltd (SSTL) is a small satellite manufacturer based in Surrey (UK) known for their company slogan “Changing the Economics of Space” and breakthrough space engineering approach (www.sstl.co.uk). By purchasing the first Space grade Commercial Off the Shelf (SCOTS) sunsensors, they are to be considered early adopters of this approach which is promoted by Lens R&D. 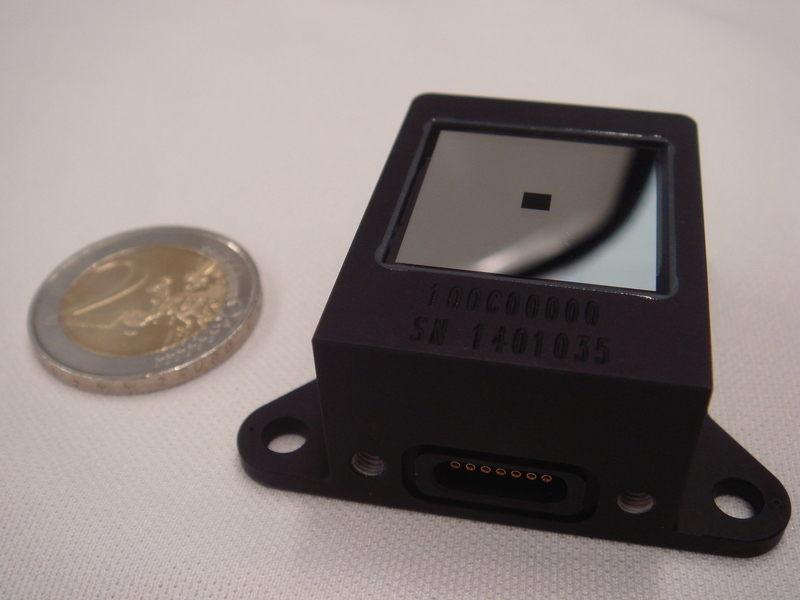 The BiSon64 sunsensors are small but highly reliable sensors specifically developed to provide a low cost alternative to common high reliability sunsensors as well as a high reliability alternative to common small satellite sunsensors. As Lens R&D is batch producing the sunsensors and the team is very limited we decided some years ago to try and sell sunsensors with a minimum order quantity only. Now the sensors will be on stock shortly and with the first sensors shipped, we are getting all the paperwork and procedures in place and concluded that with some additional handling we should be able to deliver one off sensors as well. 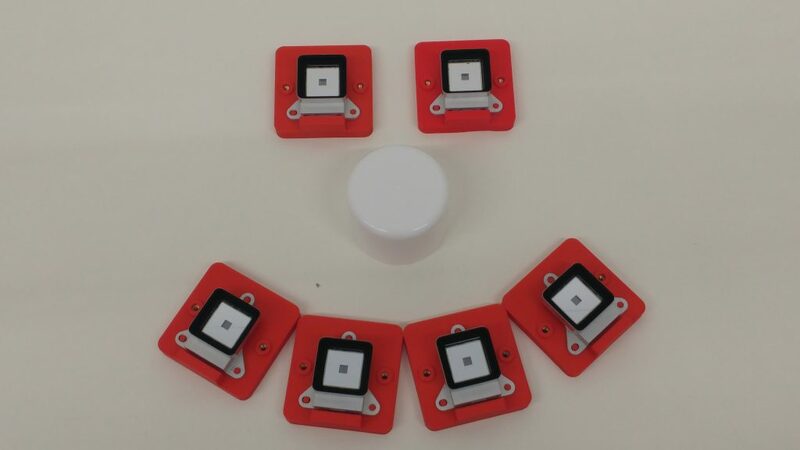 Therefore, (as a matter of test to see if it really works) we will no longer use the minimum order quantity previously quoted but we will also sell sensors on a one by one basis. In order to compensate for the additional paperwork the price will be marginally increased to 4050Euro/sensor. 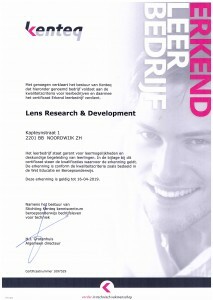 For more information call +31 71 2020 123 or send an email to info@lens-rnd.com. 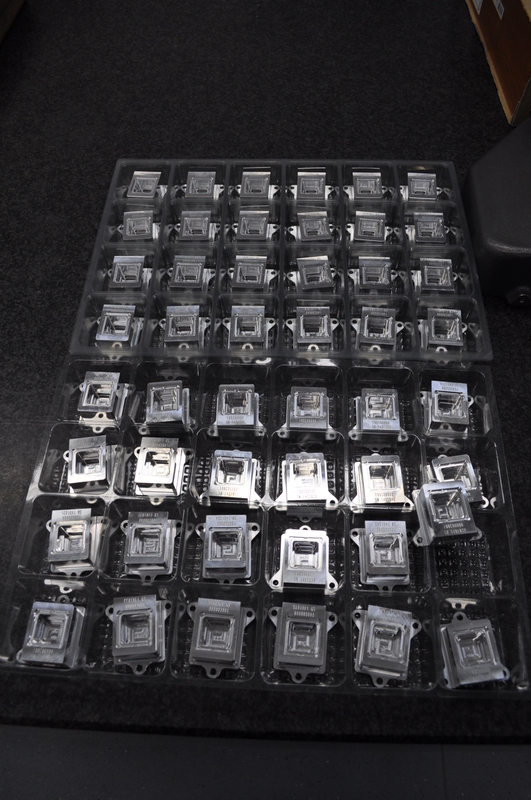 Today we received the first titanium housings for the BiSon74ET-RH. 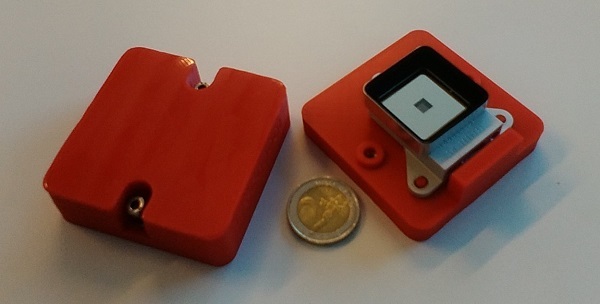 As we already had the 2mm thick sapphire membranes on stock it was quite easy to generate a first impression of what this sensor will look like once completely assembled. Therefore we would like to present a sneak preview of the sensors today. 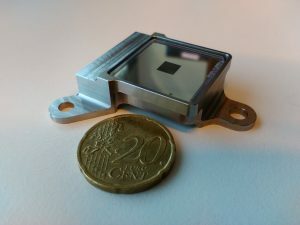 Designed in frame of an Artes 5.2 contract (for the use on extendable solar panels of Geostationary telecom satellites) and currently under production, the BiSon74ET-RH is a sunsensor that is to exhibit an unprecedented operating temperature range of +125C till -125C in combination with a very high level of radiation tolerance. 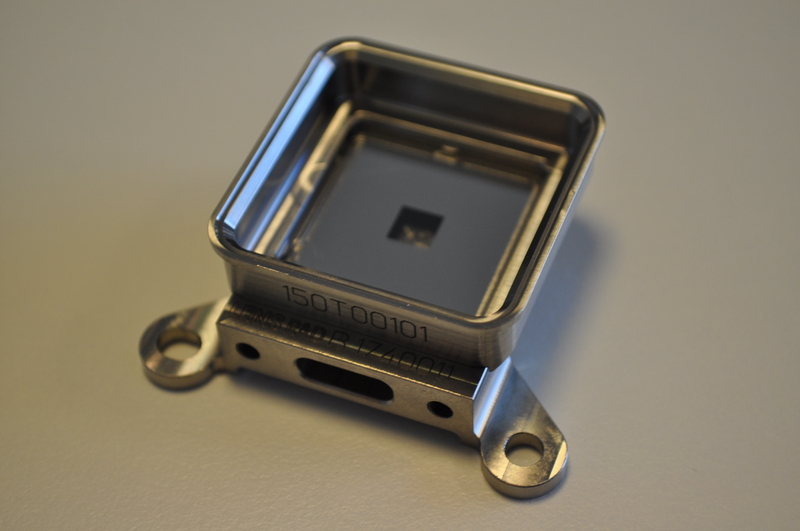 Lens R&D is currently developing extended temperature sunsensors in frame of an ESA Artes 5.2 contract. These sensors are expected to show an unprecedented operating temperature range of -125C till +125C with the intention to even reach a -145C operating temperature. These temperature ranges are required to operate a sunsensor directly on an extendable solar panel of geostationary satellites. These satellites are know to have solar panels who’s temperature can go up to +110C at end of life and go down to -110C (at worst case eclipses that can last more than three hours) at the Beginning of live of the satellite a couple of days a year. After two days of information exchange, the meetings concluded with the mutual filling in of an audit matrix. Although this showed that we didn’t get the highest score on maturity for many points, this was not due to the fact that we don’t have the procedures in place or the way of working was not appreciated, but due to the fact that we were asked to offer a project specific design which has yet to be finalized. 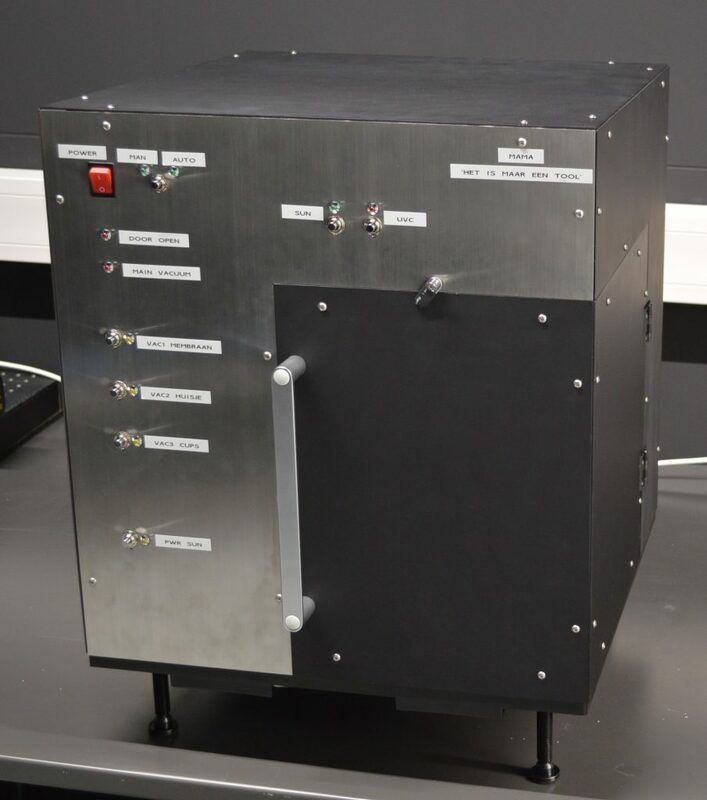 Last week, the first 15 housings for the Artes 5.2 program ITAR free extended temperature sunsensor (BiSon64-ET in short) have been received. The first housing was delivered just in time for the visit of ESA DG J.Wörner and the other 14 arrived on Monday 25th of January. Although the injection moulding tool needed for the ceramic insert is still under design, the housings will allow us to do the first high and low temperature tests on the gluing of the membrane. 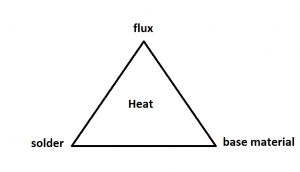 This development should put Lens R&D step by step on a path to unprecedented temperature ranges and reliability. On Wednesday 20th of January 2016, mr Jan Wörner, Director General of ESA (accompanied by several other ESA representatives as well as representatives of the ministry of Economic affairs and our national space agency NSO) visited the new optics lab of Lens R&D. 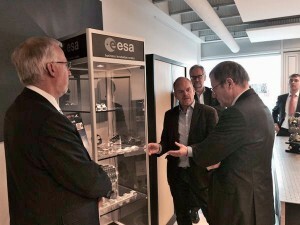 A short company introduction, (explaining the background of our sunsensors, the importance of space and the ESA business incubation program for terrestrial applications and our plans for the future) was followed by a short but very interesting discussion. Hopefully Mr. Wörner has enjoyed the visit as much as we did. 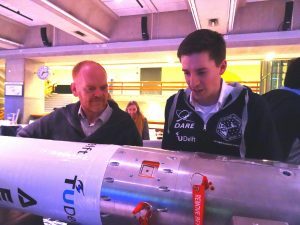 With the completion of pyroshock testing at ISIS in Delft it has been shown that the BiSon64 sunsensor is capable of surviving a launch on any launcher currently known. Next to the pyroshocks perfomed (3 in each axis) some 14 other units where sustaining the heat (and cold) of thermal cycle testing at ESTEC. Positioned in the gaseous nitrogen test facility the units were rapidly cycled between -40C and +80C at temperature change rates that reached up to 10 degrees per minute while heating up and down to -14 degrees per minute while cooling down. Both visual inspections and electrical tests confirmed that the units survived these tests without any significant degradation. 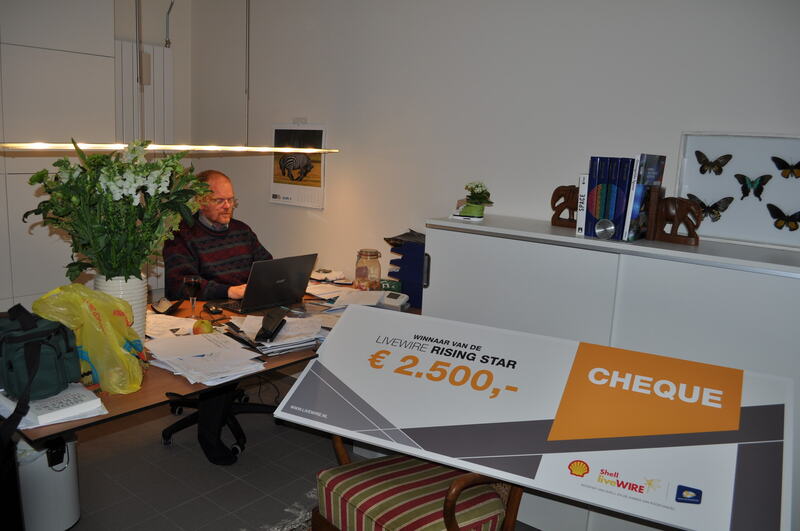 On the 21th of May, during the Shell Ecomarathon in Rotterdam, Lens R&D was awarded the title most innovative company of the Netherlands as the winner of the Shell livewire rising star competition. We were very proud to be nominated and even more proud on being selected. Many votes from all over the world helped us to get about half of the votes counted during the contest. Confirmations from the first votes cast (within an hour after sending out some emails) came from Australia and China followed by Canada, USA, Curacau, South Afrika many European countries including Russia and Kazachstan. 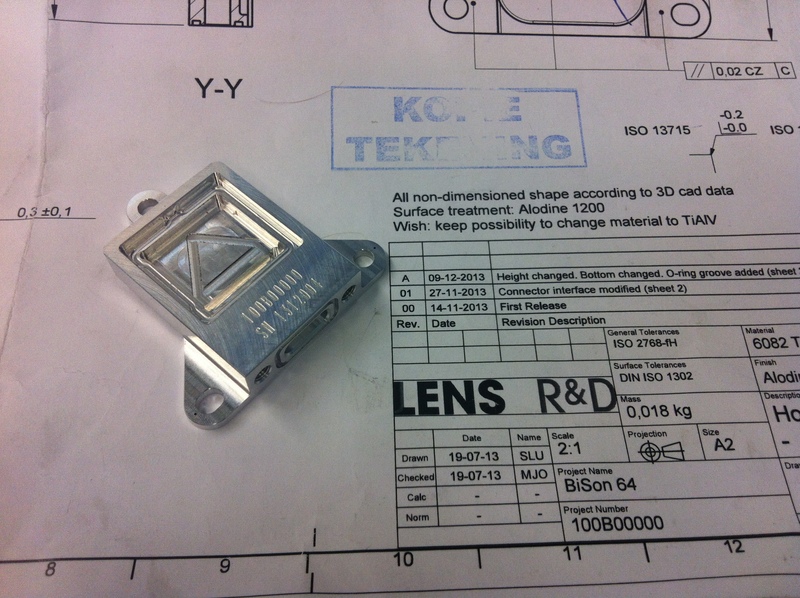 Last month, Lens R&D received a formal approval from Kenteq (certifying body) to act as a certified training company. This means it is acknowledged that students get the right level of attention and coaching while gathering practical experience in working for a real company. It is highly uncommon for a two man company to get this certification. The auditor was impressed to find such a tight quality control and structured operation in a company this size. 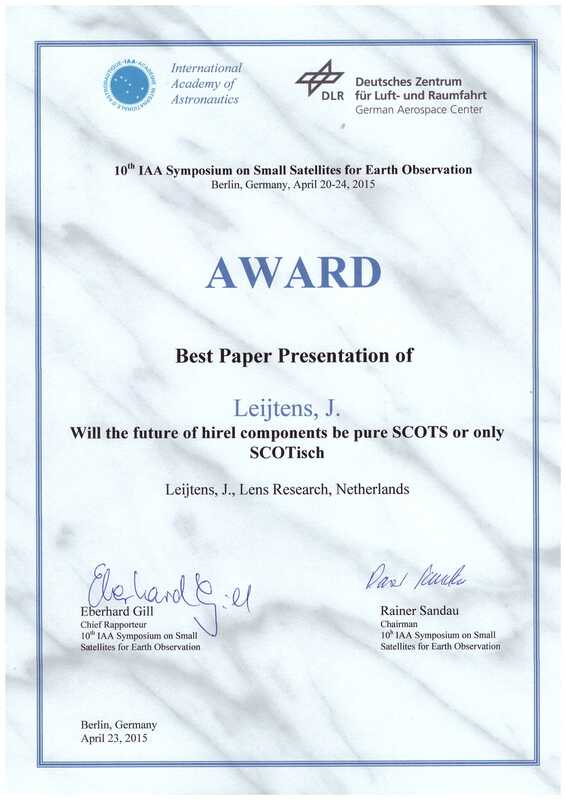 On Thursday 23th of April, the jury of the 10th IAA Symposium on small satellites for earth observation decided to grant the award for best presentation Lens R&D for their presentation on the future of high reliability components for space applications. If you want to read the presentation, you can either wait for the proceedings or send an email to info@lens-rnd.com and request a copy. Lens R&D at the finals of the Shell rising star competition. This week we got note that Lens R&D made it into the finals of the Shell rising star competition. 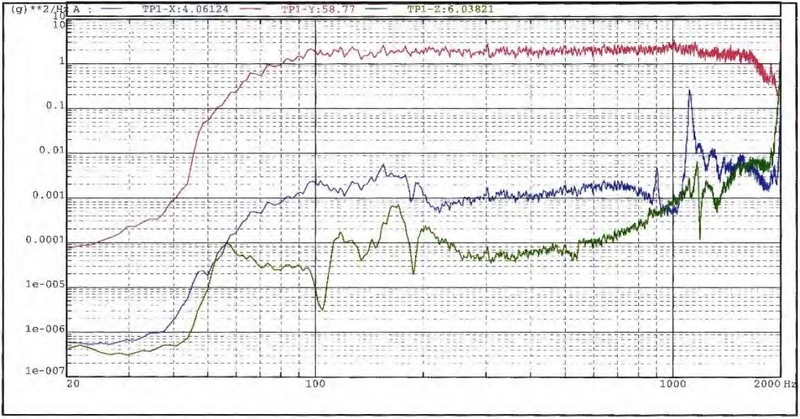 On 27th of January we completed a full vibration qualification program on the Bison 64 sunsensors showing the extremely high eigenfrequency of the units ( >2000Hz) and the capability to survive the specified 20mm peak to peak 30g sine vibrations and 37.9g random vibrations. 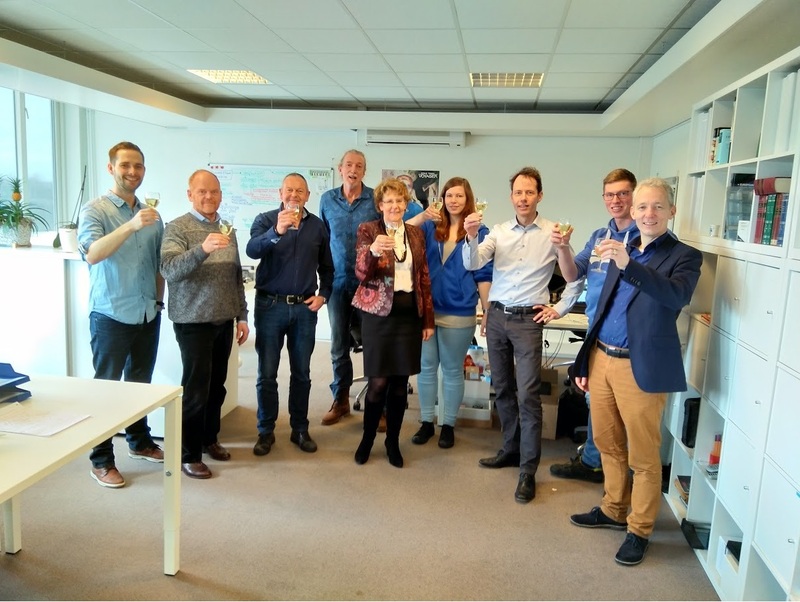 During a short ceremony at Lens R&D in Noordwijk, the ownership of 6 BiSon64 sunsensors (intended for the breadboard of the first ESAIL satellite) was transferred to our customer Luxspace. Handing over these sensors to the Deputy Managing Director of Luxspace Marino Poppé not only marked the first formal delivery of hardware to a customer who intends to use our sunsensors on board of their satellites, but also the beginning of a second phase of the qualification testing. 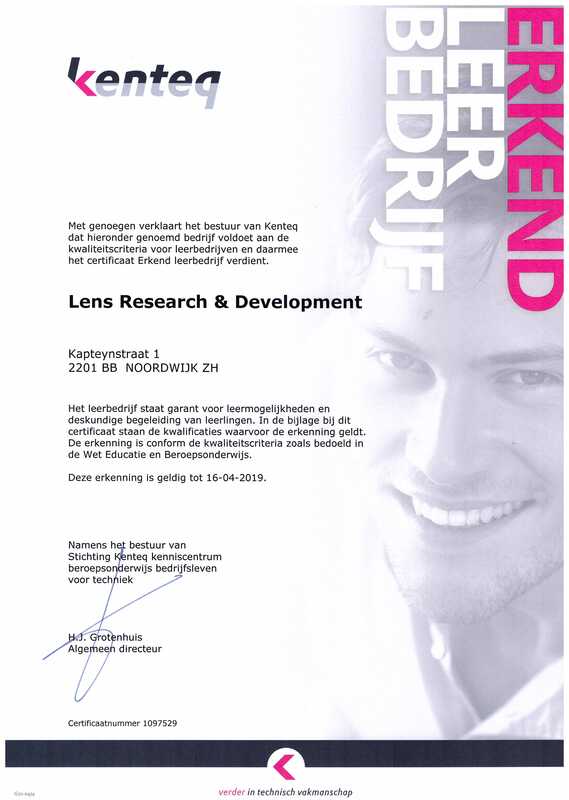 At Lens R&D we are looking forward to a promising 2015. We would like to wish a Healthy and Happy new year to everybody, Friends, colleagues, partners, customers and competitors alike. For the last couple of months, two Bison 6 sunsensors have been put to test on a real tracker. The tracker which is located at the Fraunhofer ISE in Freiburg. Because this tracker is controlled with a sunsensor that has a quite high albedo sensitivity at the end of the day there are quite significant deviations form the nominal pointing. 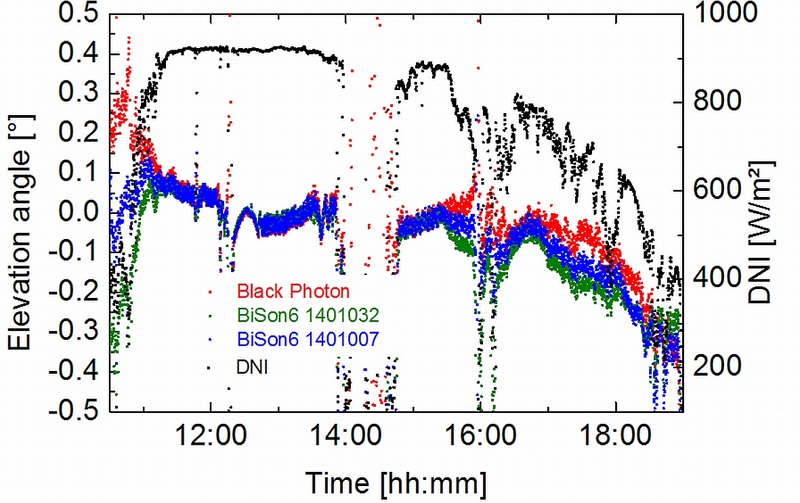 These deviations are measured with a black photon sunsensor (red line) which has a very high accuracy but is far to expensive to be considered for per tracker applications. The Bison 6 sunsensor (cost optimised for per tracker application) readings follow the Black Photon quite accurately for the majority of time, one of the Bison’s has the patented additional straylight mitigation included (blue line) and performs markedly better than the other as can be seen in the enclosed graph. It should be noted that these measurements are only from one typical day and further data analyses will have to be performed, but the measurements seem to show to us that the Bison sunsensors fall in the category almost as good but a lot more affordable. Radiation testing on the dedicated four quadrant photodiodes specifically produced for the BiSon64 sunsensors is progressing nicely with very good results. On 26th of November 2014 the preliminary results where presented at the CNES radiation workshop in Toulouse. Even after 560krad of Co-60 radiation no measureable degradation was found on the quantum efficiency and only a marginal increase in darkcurrent was noted. Although the tests will continue until the final goal of 1Mrad is reached, the measurements already show that the diodes used are very radiation tolerant and the Bison 64 sunsensors are therefore suited for even the most demanding applications. Earlier test up to 10^16 1MeV electrons already showed good radiation tolerance, but this is now confirmed for total dose. It should be noted that the test where performed on non protected diodes (no cover glass mounted) and the Bison 64 sunsensors provide approximately 1mm equivalent shielding in the front (650um sapphire) and 3mm aluminium on the other sides, thus rendering the sensors suitable for long duration GEO or MEO missions. 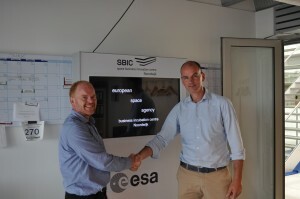 With the kick-off for an ESA ARTES21 contract to deliver 6 BiSon 64 sunsensors for a flatsat, 6 for a first satellite and an option offered for another 6 to be put on a second satellite there seems to be a convincing end for Lens R&D and the space grade BiSon 64 sunsensors to the period spend in the valley of death. 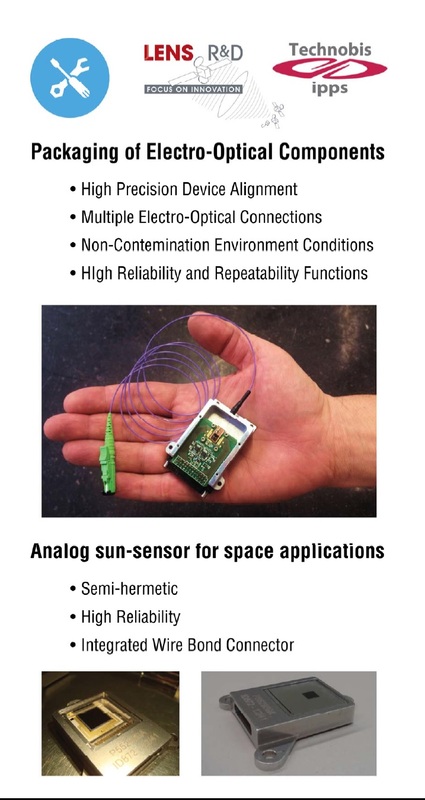 Designed to exhibit a very high reliability and best possible TCO the sensors are perfect for bringing bigsat performance to smallsats at a smallsat pricetag. 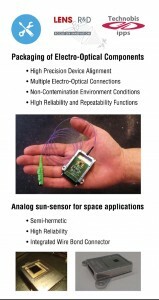 The BiSon 64 sunsensor for space applications combines high reliability and high performance with low cost. 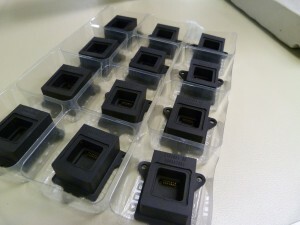 Batch produced using unattended machining, automated pick and place and an integrated wire bondable connector the sensors are both reliable, rigid and cost effective. 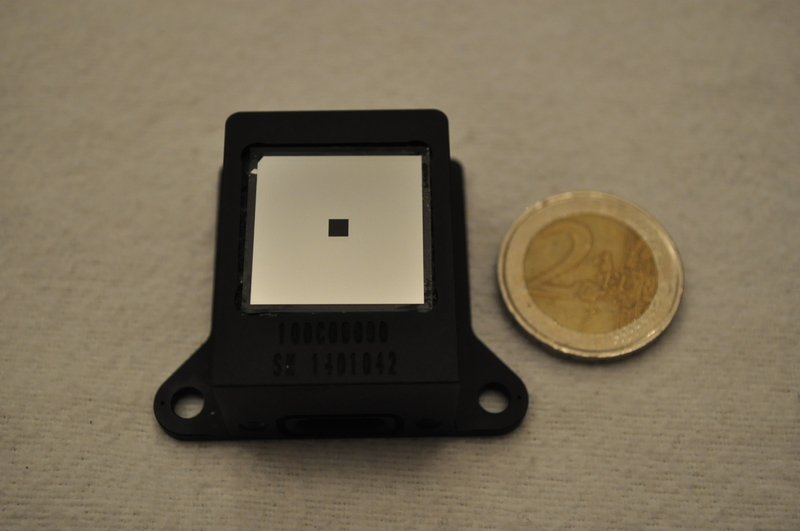 Fine sunsensors at the costs of a coarse sunsensor. Today Lens R&D succesfully concluded the final review at the ESA business incubation centre ESIC which is both the end and the begin of new phase in the existence of Lens R&D. BiSon 6 ready for product introduction. Last week, the first BiSon 6 sunsensors for solar concentrator applications where succesfully assembled, showing that the positioning of the photodiodes can be done automatically with the required accuracy, the pins can be bonded and the final unit is able to survive at least 10 cycles from +125 degrees C to -55 degrees C without any problems found. This means we are ready for product introduction at the CPV-10 in Albuquerque NM. Although further qualification testing will need to follow to prove (beyond a shadow of a doubt) that these units are able to sustain 10.000 thermal cycles between +70 and -20 degree C without any problems, we are confident that they will survive these tests. Still on track for the CPV-10, the integrated connectors (which are one of the key features allowing Lens R&D to provide cost effective yet reliable sunsensors) have been inserted in the first series of BiSon 6 housings. Although not physically present, Lens R&D was present at the photonics West to emphasize the under-estimated importance of proper packaging. A joint display with Technobis Integrated Photonics Packaging Solutions (a brand new company focussing on the packaging of integrated photonics circuits) showed some real life solutions for packaging problems and the capabilities available. 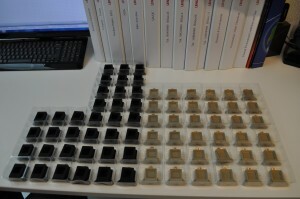 All parts are in to produce the first BiSon 6 and BiSon 64 sunsensors. Shown is the BiSon 6 for concentrated photovoltaic applications. The first batches BiSon 6 (anodized to be able to withstand the environmental stresses associated with desert conditions) and BiSon 64 (chromatised to be able to discharge electrical charges generated by cosmic radiation) have been shipped to Axon for connector insertion. The BiSon 6 solar sensor for concentrated photovoltaics is shaping up. Today the first series of housings ever produced where inspected and although some minor issues where found which will need to be corrected, we are still on track for market introduction at the CPV10 in Albequerque in april. 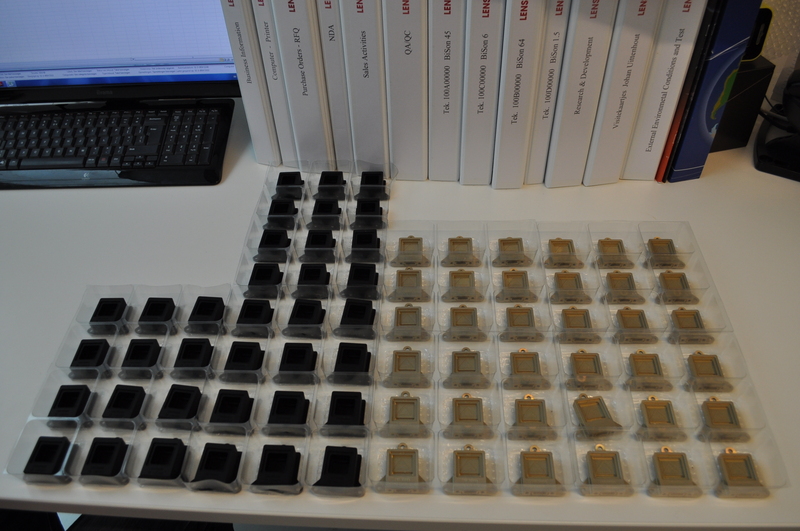 Shown is the first batch (of 48 devices) produced on the now fully qualified tool. 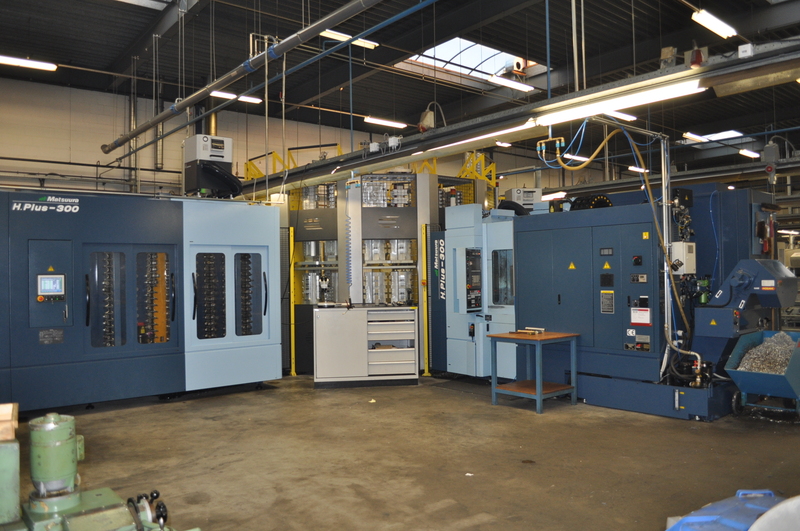 The first series of housings manufactured using the new tooling is expected shortly. Housing shown is for space grades sunsensor BiSon 64 which will use radiation tollerant Silicon and Sapphire cover glass to be able to sustain 15 years in GEO orbit. 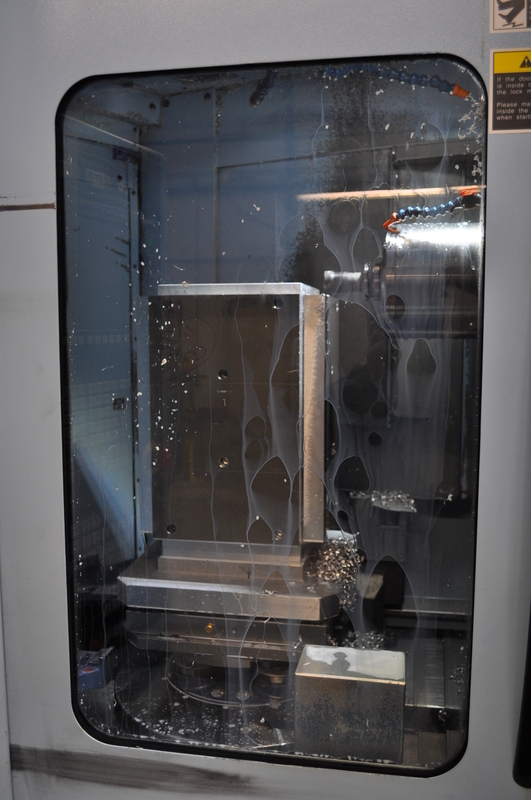 Production of the BiSon housing tooling started today on the same fully automated workstation which will produce the BiSon housings. The tool is designed to hold 48 BiSon 6 (for concentrated photovoltaic) or BiSon 64 (for satellite applications) sun sensors simultaneously and the fully automated workstation will allow for unattended manufacturing of the housing at highest precision, thus leading to part of the cost reduction which will allow an unprecedented price to performance ratio for the BiSon class sunsensors. The first batch of BiSon 6 housings are now under production and final details of the BiSon 6 configuration fixed. This has led to the official release of the product folder. The 12 participants where very diverse (from luxury yacht builders to people active in building constructions) which goes to show that adhesives are all around us. Although the course in itself doesn’t turn a nitwit into an expert, a solid background and overview of the processes and issues is provided. This in turn will allow to avoid some pitfalls and mitigate some others if issues in the field of adhesive bonding pop-up. 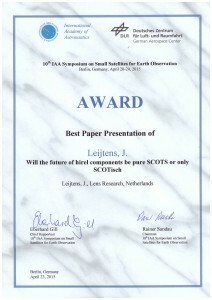 Lens R&D participated actively on the ESA ESTEC open day which was held on 6th of October 2013. Over 7500 visitors where able to witness the activities employed by companies which participate in the ESA business incubation program. A custom designed solar sensor called Bison 6 has been added to the portfolio of Lens R&D. The NASA exhibit a human adventure will be on show for 6 months at the jaarbeurs in Utrecht. As part of the Dutch addition called Dutch Dimensions, the Bison 45 sunsensor will be on display. Being displayed alongside the more conventional sunsensors currently available on the market, the decreased size can be easily confirmed. The Bison 45 prototype sunsensor has been on display in the Axon booth at the le Bourget airshow in Paris which was held from 17th till 22th of June 2013. 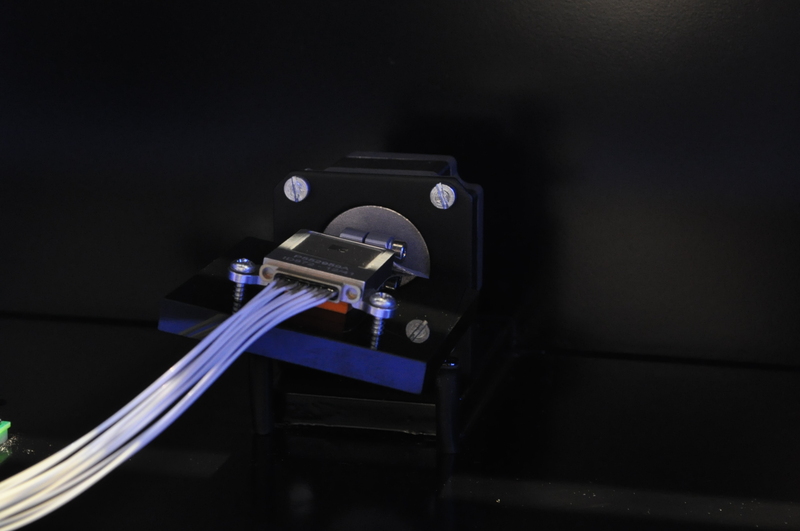 Axon Cable and Lens Research & Development have a strategic partnership and are jointly developing wire-bondeable metal packages with integrated connectors. 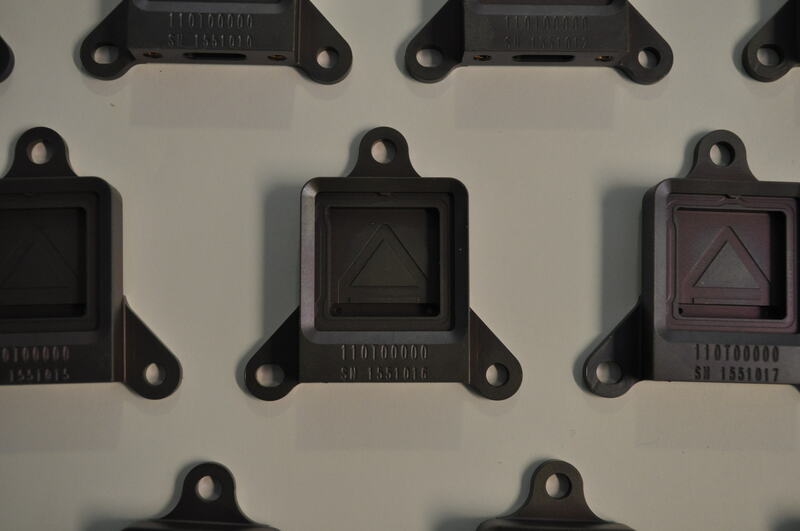 This is one of the core developments which will allow the Bison sunsensors to provide an unprecedented price to performance ratio. Lens R&D visited the NATO RTO expert meeting in Karlstad (SWE) with two presentations called “getting more for less” and “are we all going MAD”, adressing possibilities to save money while building satellites without sacrifycing reliability and potential new developments in the field of digital sunsensors. The presentations sparked some very interesting discussions and from the first feedback gathered the impression of the various participants was positive. Lens R&D has visted the international conference CPV-9, an important event on Concentrator Photovoltaics. Keeping pace with the fast and continuous growth of the technology, representatives from every part of the CPV community have attend the conference and valuable insights in the requirements relevant to sunsensors for terrestrial applications where gathered. 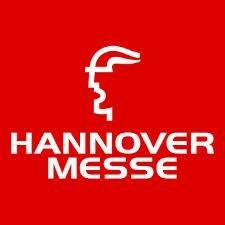 Lens R&D visited the Hannover Messe the world’s biggest industrial fair.The Leading Trade Fair for Research, Development and Technology Transfer keeps us sharp and updated. It brings people and innovative ideas together. It is where scientists, developers, engineers and managers learn about the latest innovations and where Lens R&D presented their plans to play a significant role in the development of sunsensors for terrestrial applications. Despite some difficulties for a number of American participants the conference was well attended and provided an overview of the latest activities in the field of small satellites and related technologies.